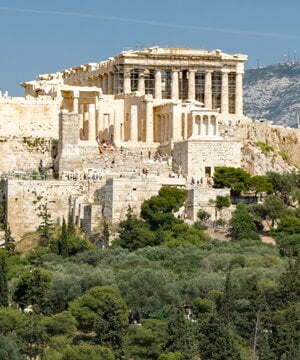 Looking for a guided tour of the Acropolis in Athens, or just want to be able to skip the lines? There are over 60 options to choose from. 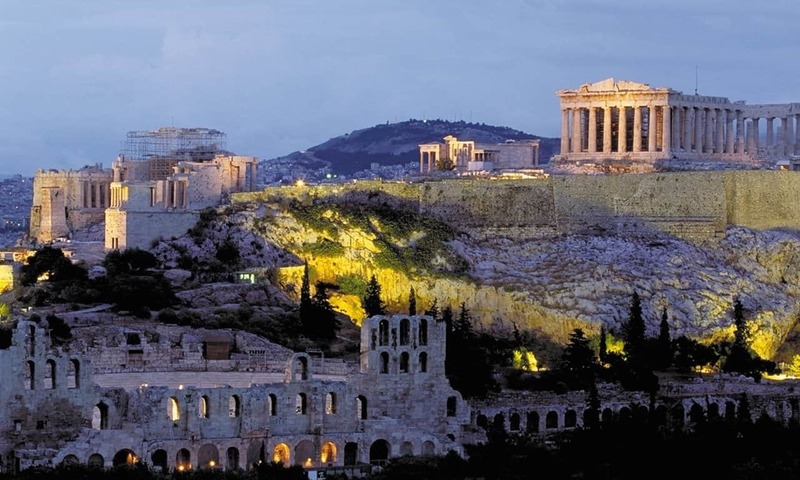 Here are our recommendations and suggestions for the best walking tours of the Acropolis. Looking on to the Acropolis with the port of Piraeus in the background. One of the more frequent questions I get asked by people planning a trip to Athens is ‘which is the best walking or guided tour of the Acropolis?’ The answer, as always, depends on a number of factors. These include, your budget, time available, what other sites are to be included, and even the age range of the participants. The Acropolis is the busiest and most popular attraction in Athens – queues at the ticket office can be long – even though tickets can now be purchased online. In the heat of an Athenian summer standing in long lines is the last thing anyone with a limited time wants to do on their holiday. Some visitors just want to be able to skip these lines, and are happy to pay extra for that. 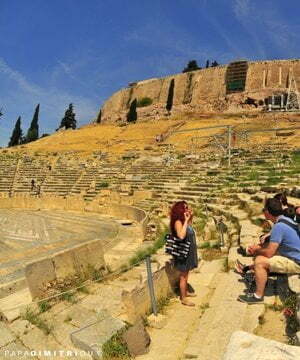 Archaeology Travel has been recommending guided tours and walks of the Acropolis for nearly five years. We have partnered with GetYourGuide because they have created a trustworthy platform that offers the widest range of activities and tours. They do not provide the tours themselves, they have created a website that allows you to find independent tour guides as well as larger companies, and then book your choice online. GetYourGuide verifies these service providers and offers a safe and secure booking process, with a favourable cancellation policy. It is a service we trust and use ourselves, and one we are confident to recommend to our readers. Also, we enjoy receiving your feedback, so let us know your experience – contact us here. Please Note: when considering the value of these guided tours and skip-the-line offers, remember that a single ticket for an adult in winter (until 31 March 2019) is €10, during summer (1 April to 31 October 2019) the price doubles to €20. Also, during the winter months (November to March, inclusive) there are very few options available. A few that are available are not good value-for-money in my opinion. For December and January, I am not convinced skip-the-line tickets are necessary. But if you do want a good audio guide, I do recommend the first on the list below. The simplest and cheapest option to avoid the queues is a straight-forward skip-the-line ticket for the Acropolis and its North and South Slopes. For this you will pay €24.50 for an adult, as opposed to €20, which is the standard ticket price. For this you not only avoid the queues at a time you choose, but you can also cancel your ticket for a full refund up to 24 hours in advance. This is not possible when buying a ticket on the official website. This is a straight-forward skip-the-line entry ticket, it does not include audio or live guides of any sort. 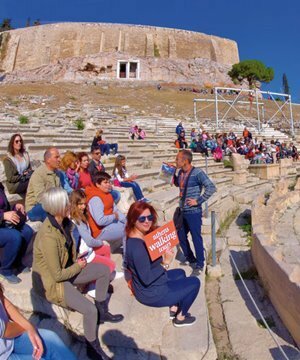 Our list below provides other suggestions, where you can get a skip-the-line ticket with audio or walking tours of the Acropolis. 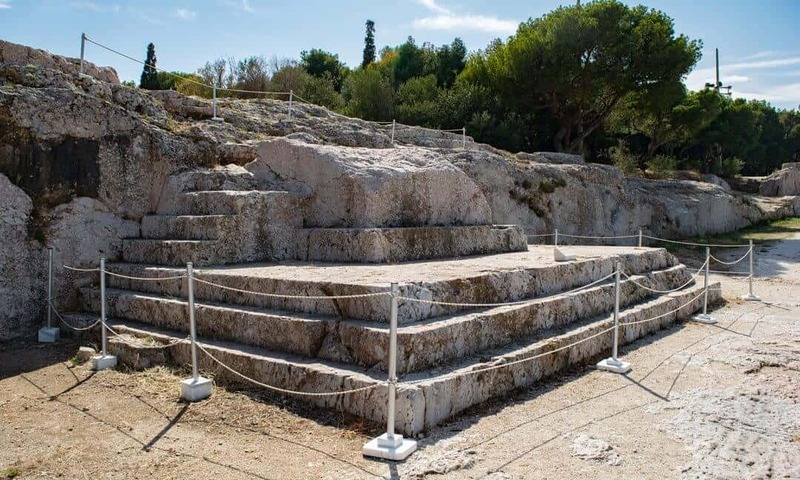 The 5th century ‘bema’ or podium that faced the open air auditorium. If you are interested in a guided tour to learn something about this incredible site and its place in history, as opposed to a way of avoiding the queues, then this is head and shoulders above the others. 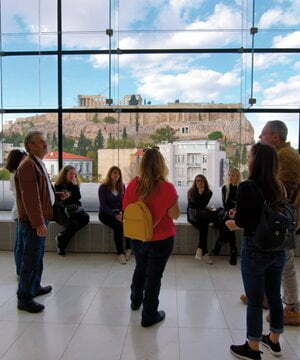 First, it is organised by GetYourGuide with Athens Walking Tours, one of the leading tour operators in Athens. 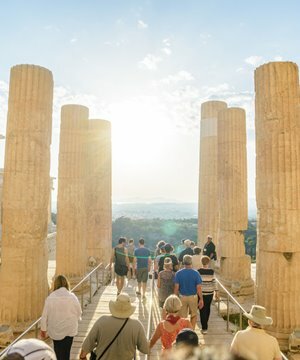 Second, an expert guide will take you on the path of Athenian democracy – a two hour walk from the Pnyx to the Acropolis. Perhaps a bit pricier than the others, but definitely worth it. An experience very few others will take away. After enjoying a few traditional Greek treats at the meeting point, your guide will take you to Pnyx Hill – the actual birthplace of democracy. From here you have one of the best views of the entrance to the hill-top sanctuary, the very Acropolis you will walk up within a matter of minutes. With the tour over, you can stay on the Acropolis to explore it more fully at your own pace – linger over the views. 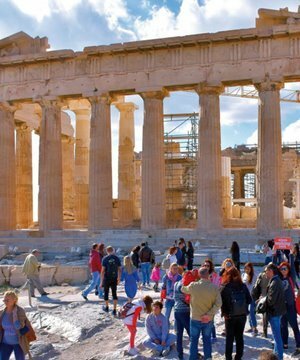 Perfect for people who want to be able to skip the long lines, and would like a guide but with the ability to to explore the amazing features of the Acropolis at their own pace. Along with a pre-booked ticket you get an audio guide to download to your smartphone – both iOS & Android. For those who prefer a live guided tour but want to beat the heat and the crowds this is a good choice. In summer you beat the heat and the crowds, which really only get going at 9.00/9.30 am. At other times of the year the light on the monuments at this time of the day can be quite magical. If you do not mind the heat of the day, which obviously varies according to the time of the year you are visiting, this two-hour guided tour in the later afternoon is a good option. Afternoons are noticeably less crowded than the mornings. And the sunlight in the later afternoon is not so direct. Of all the guided tours of the Acropolis, this is my preferred choice. Late afternoon/early evening is not only quieter with fewer people, the legendary hill top and surrounding city is just so atmospheric under the setting sun. This is definitely the best time for taking photographs. 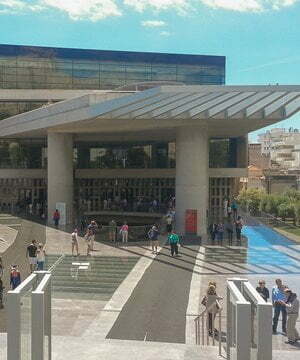 Although entry tickets are not included, this is a good choice for those who specifically want a guided tour of both the Acropolis and the Acropolis Museum. The tour begins in the museum and then moves on to the Acropolis, when the crowds have gone and the heat has eased, ending with great evening light. 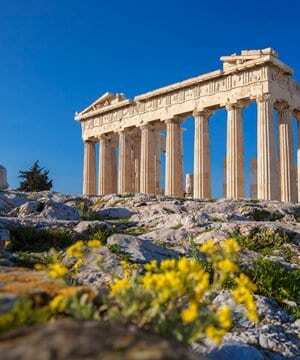 Perhaps a bit more expensive than the other options, but on this walking tour of Athens you a private guide. Besides the Acropolis and the Acropolis Museum, you also get to see some of the other ancients sites in Athens, including those in the botanical garden and one of the Metro stations. After the Acropolis in Athens, the temple of Poseidon at Cape Sounion is another popular attraction. Although not that far, it is not easy (or quick) to get to using public transport. 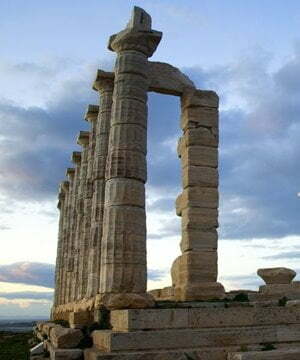 This day-long bus tour allows you to visit both the Acropolis and the stunning temple at Cape Sounion. Created for visitors to Athens on cruise ships docked at the Port of Piraeus, you get to visit the Τemple of Zeus, the Acropolis and the Acropolis Museum. Round-trip transfers from the port to the sites in central Athens is included, eliminating need to use public transport when you have limited time. An excellent choice for visitors to Athens who want to include the Acropolis and a few other museums in their sightseeing. For three consecutive days you get fast-track entry to 15 top attractions, including the Panathenaic Stadium, the Acropolis Museum, and the Cycladic and Islamic art museums. Please note: The information provided is correct as of 25 August 2018. While we endeavour to ensure the information is kept up-to-date, Archaeology Travel is not responsible for any changes the tour providers make. Please confirm the details by following the links. Of course, if you spot any changes or errors, please do contact us. Why Are entry fees not included? Despite what you may think, it is not unusual for walking tours and such like to not include the entrance fees. And this is, in fact, to your benefit. For instance, most if not all attractions have different pricing structures for different people – adults, students, pensioners, members of specific organisations … So, if you qualify for a discounted rate, you are able to do so. Also, in the case of the Acropolis, entry to the site is only €10 between November and March, but €20 from April to October. Does ‘skip-the-line’ mean just that? 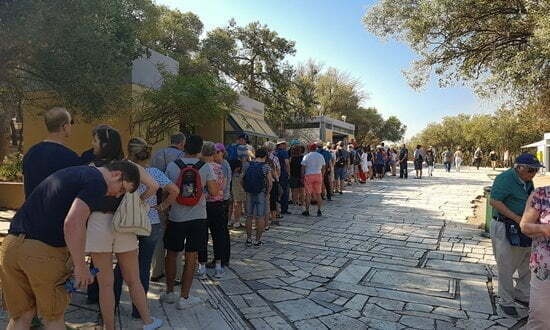 Being able to ‘skip the line’ usually only refers to the queue to purchase tickets, and certainly this is the case for the Acropolis. To ease congestion most attractions, certainly larger more popular ones, separate the purchasing of a ticket from actually entering the site. Understandably (and sometimes very frustratingly), queues for purchasing a ticket go a lot slower. At some sites, licensed guided tours are able to skip both queues. 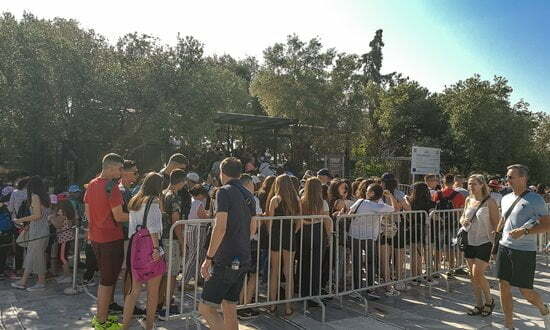 On 27 April 2018, at 9.30 am you would have waited in a queue to purchase your ticket for the Acropolis for about 45 minutes. The queue to get into the site was about 15 minutes. That is an hour in the line. Getting a pre-booked ticket save a great deal of time when it is already getting quite hot. Top Tip: Instead of going to the main entrance – go to the entrance for the Theatre of Dionysus. 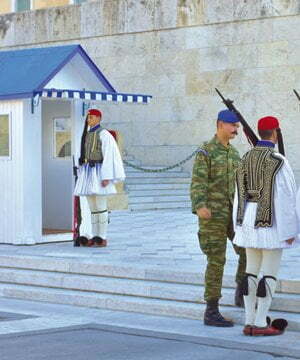 The queues are much, much shorter here because few people realise this entrance also includes the Acropolis. NextIs Stonehenge an Overhyped & Overrated Tourist Trap?